Visit this magnificent baroque botanic garden and fall in love for each element. 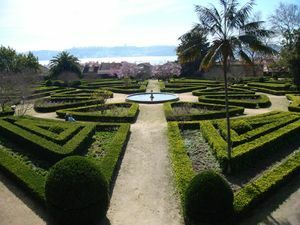 The construction of the Ajuda Botanic Garden (Jardim Botânico da Ajuda) dates back to the XVIII century, end of the baroque and presents itself as the first botanic garden in Portugal. Initially, this region was designated to the growth of fruits and vegetables meanwhile, after the order from D. José, in 1765, the construction of the 15th Botanic Garden in Europe started. Together with the Natural History National Museum which use to be closeby and the Physics Department, this garden was thought to be an educational area for the two princes, D. José and D. João. This garden is constructed under the italian architecture, with two levels on an area of 3,5 hectare. Here you might find several tropical trees and one of the biggest boxwood fences in Europe with nearly 2 kilometers wide. We recommend you to visit this garden and lose a few minutes observing the old dragon-tree, with more than 400 years old, the central Fountain designated 40 water spouts, the maidenhair greenhouse, the birds’ greenhouse, the orchids greenhouse and the D. Luis greenhouse. Students and over 65 years old - 1,00€. Children until 7 years old - free. Everyday from 10am to 5pm.